FURTHER DESECRATION OF DEAD JEWS AS SIGN ‘ARBEIT MACHT FREI’ IS STOLEN……. – The Tundra Tabloids……. FURTHER DESECRATION OF DEAD JEWS AS SIGN ‘ARBEIT MACHT FREI’ IS STOLEN……. of 6 million murdered Jews? 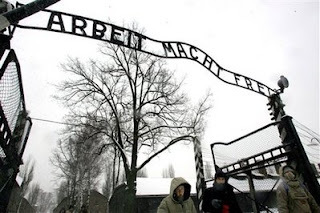 Thieves on Friday stole the notorious metal sign hanging over the entrance of the former Nazi death camp of Auschwitz that reads “Arbeit macht frei” (“Work makes free”), police said. Some 1.5 million people, mostly Jews, perished in the Nazi death camp located in southern Poland during World War Two. Prisoners arriving at the camp used to enter via a relatively small iron gate topped by the German-language motto. More than 200 hectares (500 acres) of the former death camp became a museum after the war ended. “Around 5 am today the museum administration informed us that the sign has been stolen. The whole area is under surveillance, there are many cameras there. We are now analyzing the film. I hope we will find the trail,” a spokesman for the local police told TVP Info television. The daily Gazeta Wyborcza said on its website that the museum authorities had already installed a replica sign over the gate that had been used briefly a few years ago when the original was being repaired. “This (theft) is very saddening,” Gazeta Wyborcza quoted Jaroslaw Mensfelt, the museum’s spokesman, as saying. Previous Post Previous Post LGF’S CHARLES JOHNSON RUSHES TO THE DEFENSE OF AL GORE USING PHOTOS LACKING CONTEXT……. Next Post Next Post MEXICAN STATE CHIAPAS IN DANGER OF BEING ATTRACTED TO ISLAM…….